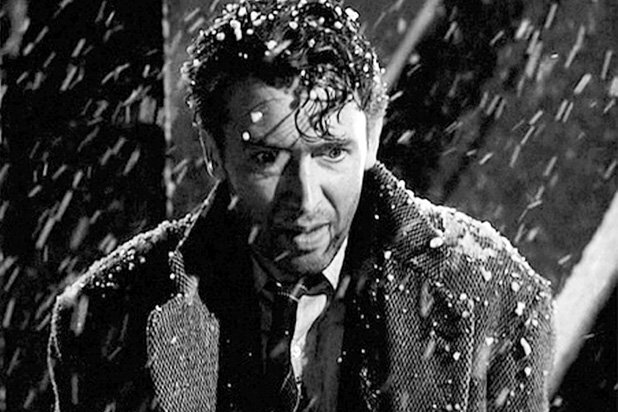 Jimmy Stewart goes from despair to elation in the classic holiday movie "It's a Wonderful Life." Haven't gotten to watch the holiday classic "It's A Wonderful Life" yet? You could stream it (and these other favorites), or you could watch it on the big screen at Center City's Philadelphia Film Center on Monday. The event is free, but in the spirit of the season, attendees are asked to bring a canned goods donation for Philabundance. Also, make sure to register online and arrive on time – it's first-come, first-seated. The movie will start at 7 p.m. Some of the items Philabundance suggests donating are canned vegetables, cereal, peanut butter, whole grain pasta and cans of soup. In case you need a refresher on "It's A Wonderful Life," the black and white film tells the story of George Bailey (James Stewart), a young man with big ambitions. George falls for his sweetheart Mary (Donna Reed), takes over the struggling family business, and faces off against greedy banker Mr. Potter (Lionel Barrymore), never managing to get out of the sleepy little town of Bedford Falls. After a series of devastating setbacks, George finds himself questioning the value of his own life. It takes a kind-hearted angel named Clarence (Henry Travers) to show George just how much his life has touched those around him.